Zubin Surkari is only the second Parsi cricketer to represent his country in a World Cup. Farokh Engineer the flamboyant wicketkeeper of the Indian cricket team was the first one, during the inaugural Prudential World Cup in 1975. 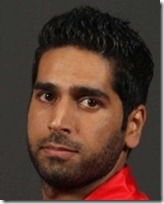 Zubin represents Canada in the current World Cup being held in India. Zubin Surkari is an orthodox batsman who is most effective batting higher up in the order where he can anchor one end and build an innings. He has been around for a number of years, but illness and injury have prevented Surkari from having an uninterrupted run in the team, and he is still finding his feet in international cricket. He can play his shots, but he’s not a big hitter and is generally slow out of the gate – which is just fine in a team that has barnstorming openers Rizwan Cheema and John Davison.